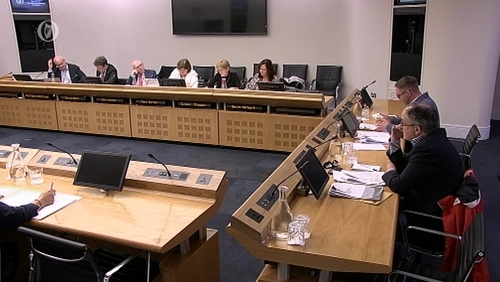 The Oireachtas Housing Committee has heard that there is still confusion over the recent re-categorisation of homeless figures. The committee is hearing from members of the Homelessness Inter-Agency Group, officials from the Department of Housing and the Dublin Regional Homeless Executive. In September, Minister for Housing Eoghan Murphy said that hundreds of people had been removed from the homelessness figures as they were no longer in emergency accommodation. However, opposition members criticised the move, saying they should still be counted as homeless. Sinn Féin's housing spokesman Eoin Ó Broin asked the Assistant Secretary at the Department of Housing, Mary Hurley, if the individuals who were removed were still homeless. Ms Hurley said the individuals concerned were not homeless, as they are being in accommodated in an "own door premises". However, Mr Ó Broin said this was at odds with the views of some local authorities, but Ms Hurley said the monthly reports relate to those in emergency accommodation, and while those concerned were still on a housing list, they were in secure homes, and not at risk of homelessness. In response to Mr Ó Broin's question, Eileen Gleeson of the Dublin Regional Homeless Executive said that she would consider those concerned homeless. "To answer the question straight, yes I would consider that they are still homeless...because they are accessing homeless services they are not counted as in emergency accommodation for the purpose of our monthy reports… but they are accessing homeless services," she said. She explained that the DHRE is constantly putting innovative responses in place to deal with homelessness, and that they pursue "own door accommodation" to give people security and it was a better solution for vulnerable people than emergency accommodation. "They are still in homeless services until such time as we can give them a tenancy and move them to a long-term solution," she said. She also told the committee that she would prefer to be discussing policy than numbers. In his opening statement to the committee, Dr Eoin O'Sullivan from TCD said the modification "has created some confusion and undermined confidence in the data as it is unclear what the criteria is for removing these households". Dr O'Sullivan also told the committee that he did not think the homeless figures had peaked. In response to Solidarity-PBP TD Mick Barry, Dr O'Sullivan said while social housing output was set to increase, it would not be enough to make a significant dent on the homeless figures. "I think there will be a continuous flow of people into homelessness from the private rented sector and we see that on a quarter by quarter basis," he said. He also said that they are seeing a decrease in the number of exits from homelessness, and that the figures of 250 adults in Dublin exiting emergency accommodation in the second quarter was an "all time low". Given the squeeze on units in the private sector, and the dependency on the private sector, he said he could see very little on the horizon to suggest an improvement in the next 12 months.